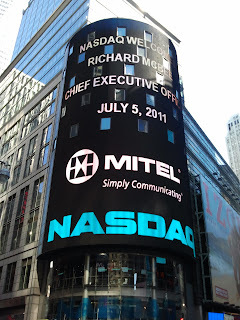 About a year ago, Mitel had its second IPO. The company went private around ten years ago when its co-founder Sir Terry Mathews returned and took the company private. 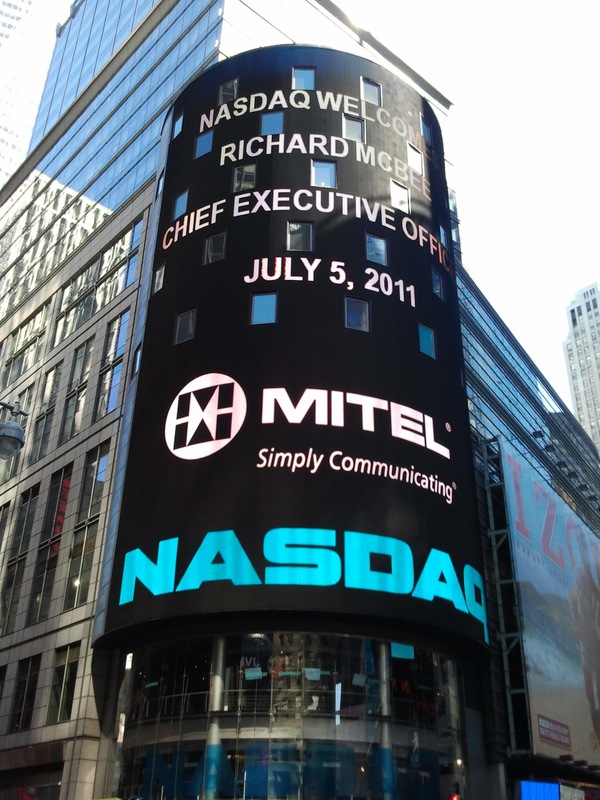 On July 5th, Mitel CEO Rich McBee rang the proverbial closing bell (NASDAQ doesn’t actually have a bell) and conducted a financial sector analyst briefing at NASDAQ’s Time Square office on July 6th. NASDAQ is more High Tech than the NYSE – they don’t actually have a trading floor as it is all electronic. 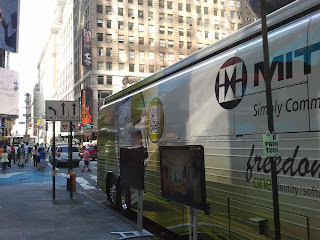 Instead, they have a storefront on Times Square. 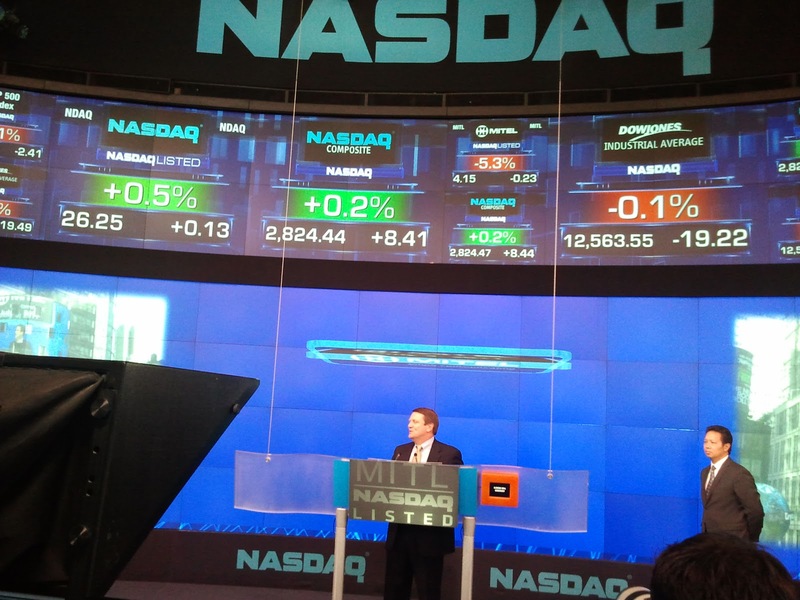 CEO Rich McBee rings the closing bell on July 5th. This ritual has a lot of ceremony, and as one might guess it is highly punctual. The ceremony is complete with a countdown timer and is live streamed to to the outside electronic billboard and news media outlets. McBee joined Mitel last January, replacing Don Smith. McBee came from the Communications and Enterprise Group at Danaher Corporation. Also making the trip was the Mitel Freedom bus – parked on Times Square outside NASDAQ for two days, ‘disruptin’ several street vendors. 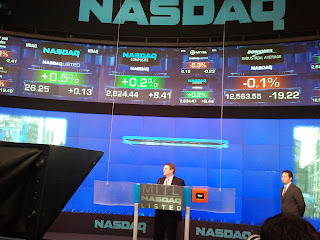 The whole event was pretty spectacular – my first trip to NASDAQ. Most of the senior executives made the trip. The bell ringing event included dealers and customers and the briefing was well attended. The briefing story was similar to Mitel’s recent Business Partner Conference, but with a financial bent. McBee’s is taking several actions to improve awareness of the Mitel brand, and evidently that includes entering the lion’s den of the New York financial analyst sector. Significant go-to-market changes were implemented last quarter. Mitel believes that its product portfolio and major prior investments with improved execution will lead to a big improvement in its results.